Third-place winner Kara Puerschner delivers her pitch at the 2018 Seattle Film Summit Pitch Panel. Last month the Northwest Screenwriters Guild hosted a pitch panel at the 2018 Seattle Film Summit with some of Hollywood’s biggest heavyweights, giving 12 writers a chance to win over a thousand dollars in prizes. More than 50 Northwest writers submitted 60-second video pitches in hopes of being selected to present their ideas in front of these professionals, as well as a live audience of over 200 people. Grand prize winner, Myra Dietzel, won free admission to TheFilmSchool Winter Writing Intensive along with free software and other prizes. All writers were fortunate to have their ideas vetted by top Hollywood professionals, such as Christopher Lockhart, who reads scripts for Will Smith, Robert Downey, Jr., Liam Neeson, Michelle Pfeiffer, and more, as head of story at talent agency juggernaut WME. They also got feedback on their movie ideas from Sean Robins, producer of such properties as TAG, Tom Cruise’s KNIGHT AND DAY, among others. Screenwriters from the Pacific Northwest submitted more than 50 video pitches to compete in the 2018 Seattle Film Summit Pitch Panel. For those who showed literary promise, we had two managers on hand to field ideas, as well: Josh Adler from Circle of Confusion, and Kevin Parker from Artists First. And of course, if you’re idea was contained and capable of being shot at the right budget, critically-acclaimed indie producer Alex Schepsman, producer in-residence of The Bigfoot Green Room, was there to get your pitch off the ground. The judges and the winners. From left to right: Kevin Parker (literary manager, Artists First), Christopher Lockhart (head of story, WME), Josh Adler (lit manager, Circle of Confusion), Alex Schepsman (producer in-residence, The Bigfoot Green Room), competition winners Kara Puerschner (3rd place), Arthur Rains-McNally (2nd place), and Myra Dietzel (1st place). After about one hour of hearing pitches, the judges announced winners. Aforementioned Myra Dietzel won first place. Coming in second was Arthur Rains-McNally. And last but not least, Kara Puerschner came in third. All writers are from the greater Seattle area. 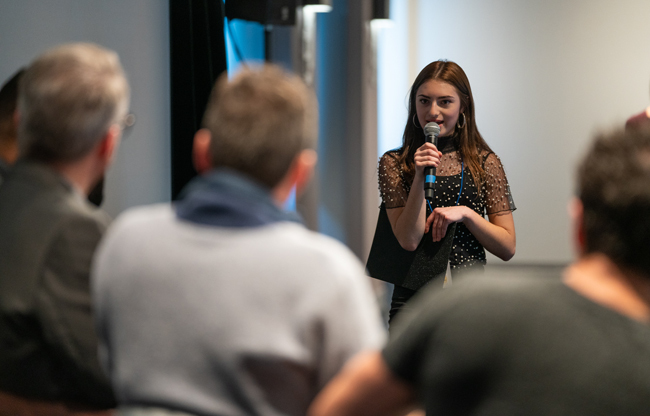 Participating in events like the Seattle Film Summit Pitch Panel is just one of the perks of joining the Northwest Screenwriters Guild, where up-and-coming writers connect with amazing resources to improve their craft and make industry connections. Industry executive Wendy Kram leads a workshop on ways for screenwriters to submit material for consideration. Wendy Kram’s mantra is to help screenwriters get past their “I’m not good at pitching” fear. 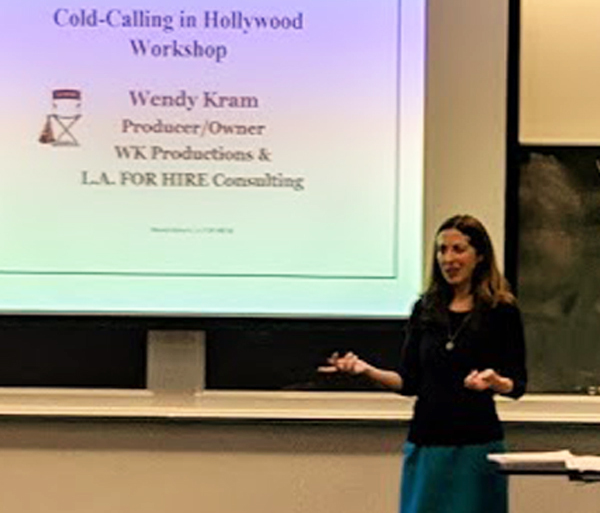 Kram, a producer and owner of the Hollywood consulting firm L.A. FOR HIRE, shared her industry insights with the Northwest Screenwriters Guild at Seattle University April 14. The event, co-sponsored by Seattle U., was a mix of seminar and workshop, as Kram helped some attendees improve their introductions and pitches on the spot. Currently producing projects with Anonymous Content, Kram has more than 20 years of experience consulting, producing, and developing projects at major Hollywood studios. So when it comes to pitches, she stressed the importance of highlighting the distinguishing factors not only of the story you’re pitching, but also of your background. “Everyone has some unique expertise, some distinguishing factor” that helps substantiate expertise driving the story being pitched, Kram said. It can often be a particular uniqueness that can pique the interest of the industry executives. “Take stock in your background,” she said. “Don’t forget to mention the obvious.” For example, if your script won an award or was a finalist in a major competition, mention it. If you’re a lawyer pitching an idea about lawyers, be sure to mention you’re a lawyer. Expertise in the world of your story gains trust with producers, she added. In addition to uniqueness and expertise, Kram said producers also gravitate toward pre-existing source material, such as books, plays, and true stories. That book you loved 15 years ago that never got produced as a film may be available for a low-cost or even no-cost option agreement, she said. The source material, she noted, does not necessarily have to have achieved great levels of fame. Even a locally produced play that received local notoriety, or a blog with a regular following, can be enough to pique the interest of a producer. Kram also stressed the importance of writers’ willingness to sign the industry-standard submission release forms when asked to do so, as well as consulting with an entertainment attorney prior to signing a release form. Northwest Screenwriters Guild members can contact Wendy by wendy@la4hire.com or 310-994-3258 to discuss services that might be the right fit, or to customize services to fit individual needs. Learn more about the benefits of NwSG membership. Troy Hunter (left) and Geof Miller say pitchfests are about developing relationships. Completing a feature-length screenplay is daunting enough, but what can you do to convince someone — especially producers — it’s worth their time to read it? Condensing your 100-page screenplay into a nimble verbal pitch is an art in itself. And if you’re uncomfortable even attempting to do so, you can relax, because the art of the pitch can be learned, and mastered. More importantly, say Geof Miller and Troy Hunter, a quality pitch can be the start of a beautiful relationship. Miller, president of the Northwest Screenwriters Guild, and his writing partner Hunter, also an NwSG member, have developed some of their strongest professional relationships with producers that started at pitch fests. 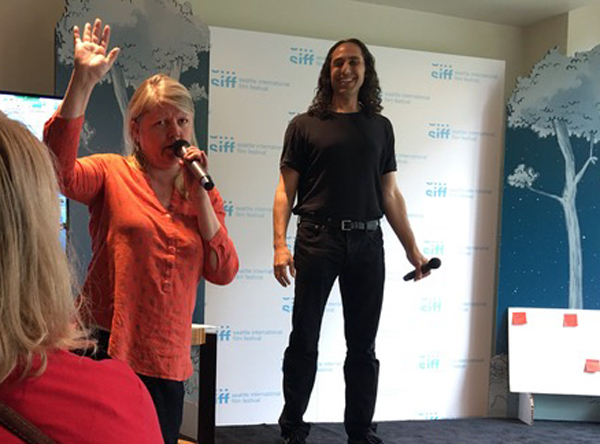 Miller and Hunter presented their pitch-fest best practices August 20 at the NwSG “Get the Most out of Pitch Fests” event, held at Seattle’s Couth Buzzard Books. “It’s not a pitch fest, it’s a meeting fest,” Miller stressed, noting that few — if any — screenplays are outright purchased at pitch fests. Hunter added, “It’s access to people you otherwise wouldn’t have access to.” And both said your main goal should be to build relationships with the producers — and even producers’ assistants who may be there in lieu of their bosses. “It’s important to demonstrate you can collaborate, because filmmaking and story development is collaborative,” Miller said. Pitch fests typically allot five minutes to meet with a given production company, so it’s important to do your research in advance, and target the production companies who produce work similar to the stories you’ll be pitching. Miller says IMDbPro is the best resource not only for what production companies have produced, but also what they have in development, which even for small companies can be several projects. The best approach is to go into pitch fests with three ideas, briefly introduce each one — a sentence for each idea — and then ask which idea the producer would like to learn more about. Remember, you likely have a total of five minutes, so brevity is key. NwSG Members: You may download Troy and Geof’s presentation from our Members Only password-protected directory. You’ll receive login and password information via email by August 28. Not a member? Learn about NwSG membership benefits. And Hunter noted, “If they’re not interested in what you have, your job is not to change their mind.” Instead, pivot to, “What are you looking for?” And share ideas you might have related to their interests. Both agreed that props and leavebehinds are bad ideas at pitch fests. And rarely are business cards even exchanged. Miller and Hunter both have scraps of paper handy to gather producers’ contact information. “When you get their contact info, you win,” Miller said, underscoring the main purpose of pitch fests: developing relationships. And for that reason, he added, pitch fests may not be for you if you only have one screenplay you hope to sell. Managers and producers are only interested in career-oriented screenwriters — those who continually generate ideas and write screenplays. Hunter added it’s important not to get discouraged if a producer doesn’t request your screenplay because producers often are looking for something very specific, even if you’ve presented an idea in the same genre. Posted on June 11, 2017 by George Thomas Jr.
NWSG borad member Betty Kim critiques Adam Sheridan’s pitch at SIFF. Anyone who has ever attended the annual Seattle International Film Festival knows the festival is much more than a program of films from around the world. Mirroring the industry itself, SIFF’s approach highlights the collaborative aspect of filmmaking through forums and educational workshops. And as part of SIFF 2017, the Northwest Screenwriters Guild tapped into the educational vein with its pitching and Look Book demo, held June 4 at the SIFF Filmmaker Lounge in Seattle’s Pan Pacific Hotel. Screenwriters appreciate all too well the importance of a compelling pitch, but the idea of a Look Book may be a new concept to some. Look Books are brief video presentations — typically 90 seconds or so — that help producers, directors and studio executives experience how a film made from a screenplay might look, sound, and feel. Geof Miller, NWSG president, explained how Look Books are an important part of the pitch, because the verbal pitch alone may not always help producers “feel” how the screenplay may translate to the big screen. For the pitching demo, NWSG board member Betty Kim critiqued several pitches by NWSG members — one of whom, Kate Calamatta, shared her experience pitching in front of an audience. Kim is featured in Blake Snyder‘s Save the Cat Strikes Back for her pitching method. The https://nwsg.org/pitches-feeling-the-fear/NWSG mission is to promote professional screenwriting as a career, and regularly holds events to help screenwriters develop their pitch, create look books, and gain a better understanding of the industry. Join our mailing list to be alerted to upcoming events, and see more photos from the SIFF event on our Facebook page. NWSG board member Kate Calamatta pitches at the 2017 Seattle International Film Festival. One of the major problems screenwriters face is a fear of pitching. Your screenplay, crafted and honed over months or years is now at the mercy of your ability to stand in a room and make it sound irresistible to producers/agents/friends/writer’s group members/random people. That’s a lot of pressure! Last week I attended the Northwest Screenwriters Guild “Script Tease and Pitching Demo” event at the Seattle International Film Festival as one of the pitchers. I wrote and rewrote my pitch, practiced beforehand and tried to memorize each beat of my screenplay in order to deliver a flawless patter. Despite all this preparation, when my time came to take the stage my heart pounded so hard I was concerned for my health. Whilst watching Betty Kim demonstrate her witty and engaging “perfect pitch” of “Legally Blonde,” all I could think was: “I will never be that good.” And I was right. My pitch was rushed, long, slightly rambling and, to top it off, I was obliged to hold the microphone with both hands so that no one could see me tremble. Now, put me in front of a group of academics and ask me to talk about my favorite research topics and I will not miss a step. I’ll field questions, defend research and effusively bring each and every person into my research stories. Why does pitching my own creative work turn me into a bumbling bundle of nerves? I think the answer is twofold. Firstly, I usually know my research with an intimacy that’s missing in my screenplays. Research is a long, slow process with multiple stages that have to be stepped through methodically. My screenplays take less that a year to write, compared to my Ph.D., which took 12 years. Believe me, I know that thesis inside out. Second is the issue of confidence. When I come to present research I am certain of my findings because I am sure of my methodology. If anyone wants to unpick my results their input will only improve my work. A screenplay is totally different. The value of my work is unknown. One person may love it, another may hate it and, to make things more complicated, I have no real idea whether it’s any good at all! I am throwing everything into the deep end and hoping my characters can swim. Is that any reason not to pitch? No, of course not. I truly believe that the only way to get better at pitching is to do it over and over until it feels right. Yes, you can read books, learn from those more experienced but nothing beats standing on that stage because, no matter how much of a fool you might feel, everyone looks at you at sees one thing: a screenwriter. How do you deal with the nerves and stress of live pitching? Feel free to comment and share your thoughts.